Most of our trip we stayed on board the Passing Cloud, but we occasionally took to the zodiac to view wildlife, or to land on a special island. One or two Hittys came with me whenever we visited dry land. 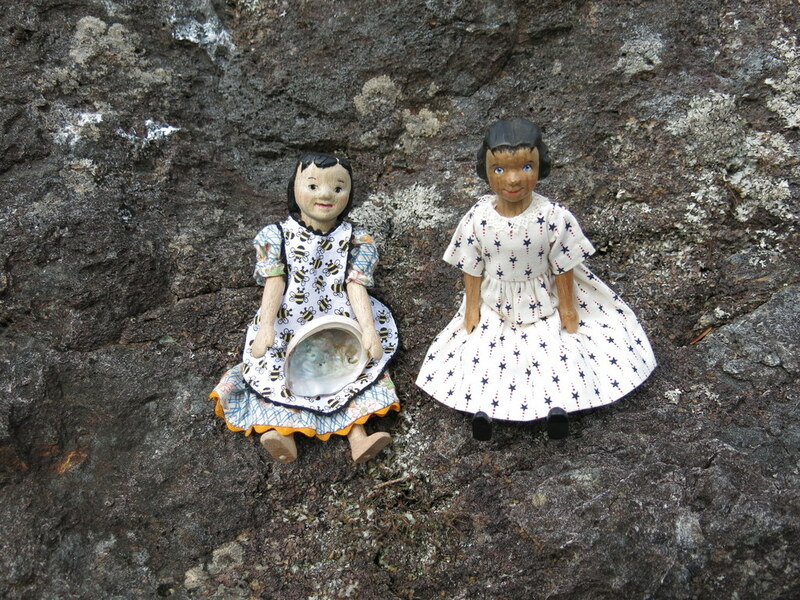 I put Hittys Prim and Florence in my pocket when we stopped at Hotsprings. In 2012, a big earthquake appeared to have closed off the springs, but hot water seems to be trickling back. New pools are being built to capture it in the places where the water is bubbling up. We were very happy to hear that the small Keen’s Long-eared bat mothers still come to the island to have their babies in the warm rocks around the Hotsprings. On the beach in front of the pools, Florence found an Abalone shell! 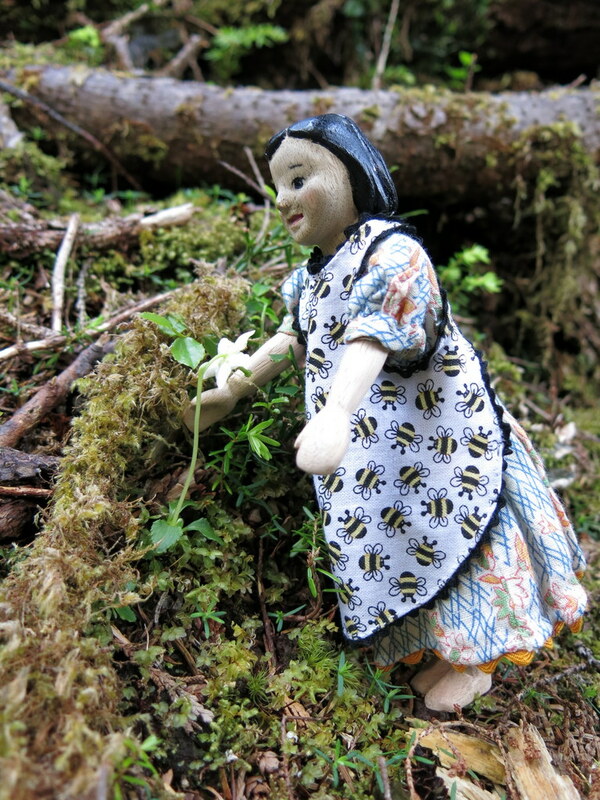 Last year Tansy met Jiixa, the artist-in-residence at Hotsprings Click here to see the blog post about that visit! 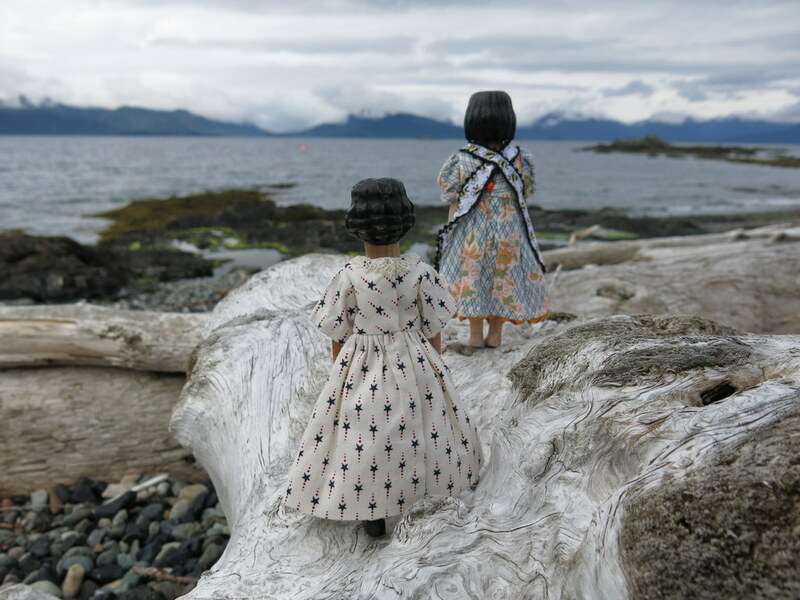 Florence and Prim were especially glad to visit this island and absorb a bit of its loveliness because at the end of the trip they will be going off to be Jiixa’s Hittys! 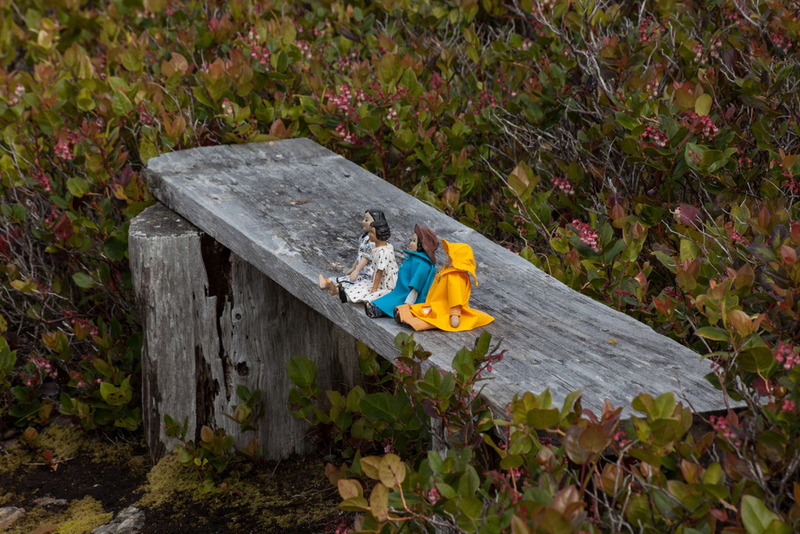 Constance and Tansy stowed away in the photographer’s pocket too!! 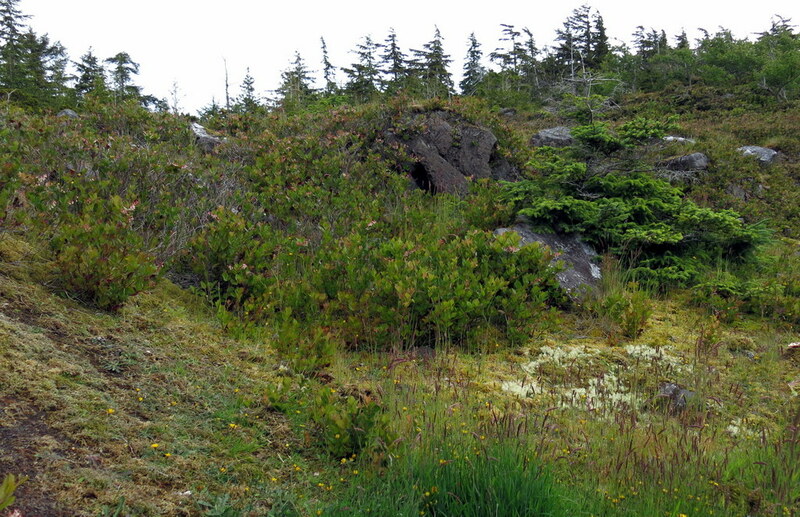 A Quartet of girls rested in the dwarf Salal patch. And on the way back to the boat, Florence found a Single Delight flower! These girls are extremely lucky to participate in such a wonderful adventure!!!! It is a blessing to share the journey! Thank you soooooooooo much! Girls are awful pretty too!!!! They are lucky! I am glad you like the girls, and you are very welcome, we love to share our adventures! 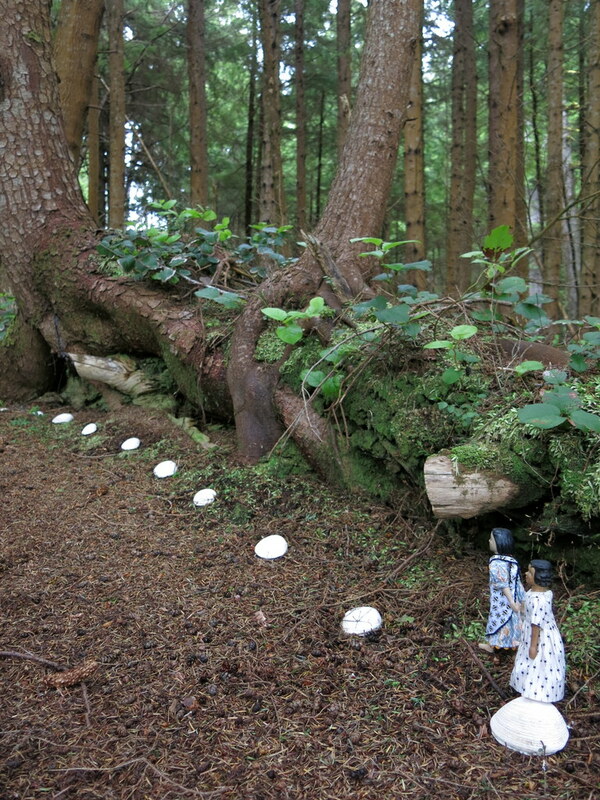 Thanks for today’s jaunt…and it’s heartwarming to hear of the wonderful gifts of the dolls to Jiixa. 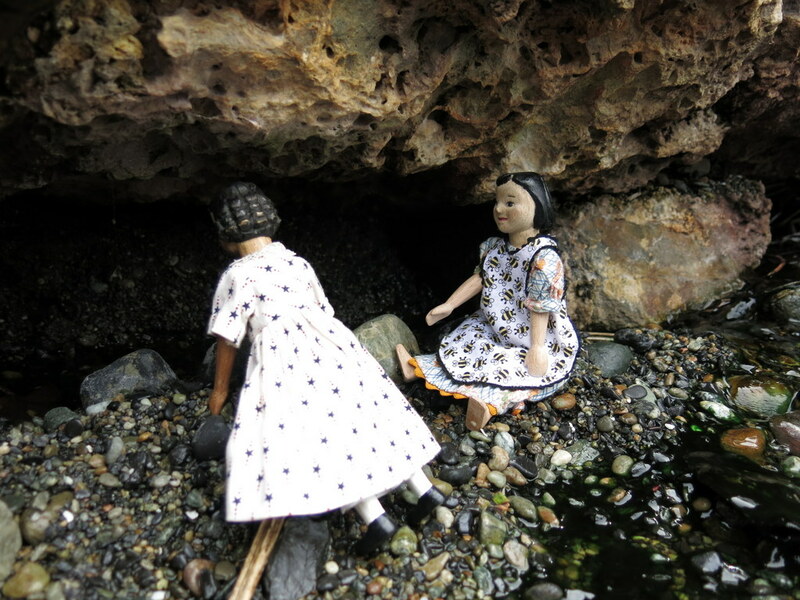 We were so glad to visit the Hotsprings Island and learn its interesting history…it was a pleasure to take the dolls to the island where Jiixa worked last year! How wonderful that Jiixa will have the charming companionship of Florence and Prim in such a heavenly beautiful place! It’s breath taking! Thank you for sharing it with us! I feel blessed to vicariously enjoy this incredible loveliness! We are happy that Florence and Prim got to experience this beautiful island before they go to live with Jiixa! Lucky dolls! Lucky me!! I was absolutely mesmerized with this story from the first photo to the last. Wonderful!!! Abalone shells are my favorite (memories of my Grandmom in California) I’ve never seen a wee one before this. Just lovely. I think if the little abalone had had a chance to grow a little, it would have been a bigger one! We were in a National Park so the wee abalone stayed on the island! Looks like you and the girls had a very nice time. Always so interesting to see more of the islands and learn about their history. Welcome home! We did have a extremely nice time!! We loved having the chance to explore the islands a little!